Going to the shore on the first morning of the vacation, the young English boy stopped at a turning of the path and looked down at a wild and rocky bay, and then over the crowded beach he knew so well from other years. His mother walked on in front of him, carrying a bright striped bag in one hand. Her other arm, swinging loose, was very white in the sun. The boy watched that white, naked arm, and turned his eyes, which had a frown behind them, toward the bay and back again to his mother. When she felt he was not with her, she swung around. “Oh, there you are, Jerry!” she said. She looked impatient, then smiled. “Why, darling, would you rather not come with me? Would you rather---“ She frowned, conscientiously worrying over what amusements he might secretly be longing for, which she had been too busy or too careless to imagine. He was very familiar with that anxious, apologetic smile. Contrition sent him running after her. And yet, as he ran, he looked back over his shoulder at the wild bay; and all morning, as he played on the safe beach, he was thinking of it. She gave the idea her attention. It was a wild-looking place, and there was no one there; but she said, “Of course, Jerry. When you’ve had enough, come to the big beach. Or just go straight back to the villa, if you like.” She walked away, that bare arm, now slightly reddened from yesterday’s sun, swinging. And he almost ran after her again, feeling it unbearable that she should go by herself, but he did not. She was thinking, Of course he’s old enough to be safe without me. Have I been keeping him too close? He mustn’t feel he ought to be with me. I must be careful. He was an only child, eleven years old. She was a widow. She was determined to be neither possessive nor lacking in devotion. She went worrying off to her beach. As for Jerry, once he saw that his mother had gained her beach, he began the steep descent to the bay. From where he was, high up among red-brown rocks, it was a scoop of moving bluish green fringed with white. As he went lower, he saw that spread among small promontories and inlets of rough, sharp rock, and the crisping, lapping surface showed stains of purple and darker blue. Finally, as he ran sliding and scraping down the last few yards, he saw an edge of white surf and the shallow, luminous movement of water over white sand, and, beyond that, a solid, heavy blue. He ran straight into the water and began swimming. He was a good swimmer. He went out fast over the gleaming sand, over a middle region where rocks lay like discolored monsters under the surface, and then he was in the real sea, a warm sea where irregular cold currents from the deep water shocked his limbs. When he was so far out that he could look back not only on the little bay but past the promontory that was between it and the big beach, he floated on the buoyant surface and looked for his mother. There she was, a speck of yellow under an umbrella that looked like a slice of orange peel. He swam back to the shore, relieved at being sure she was there, but all at once lonely. On the edge of a small cape that marked the side of the bay away from the promontory was a loose scatter of rocks. Above them, some boys were stripping off their clothes. They came running, naked, down to the rocks. The English boy swam toward them, but kept his distance at a stone’s throw. They were of that coast; all of them were burned smooth dark brown and speaking a language he did not understand. To be with them, of them, was a craving that filled his whole body. He swam a little closer; they turned and watched him with narrowed, alert dark eyes. Then one smiled and waved. It was enough. In a minute, he had swum in and was on the rocks beside them, smiling with a desperate, nervous supplication. They shouted cheerful greetings at him; and then, as he preserved his nervous, uncomprehending smile, they understood that he was a foreigner strayed from his own beach, and they proceeded to forget him. But he was happy. He was with them. They began diving again and again from a high point into a well of blue sea between rough, pointed rocks. After they had dived and come up, they swam around, hauled themselves up, and waited their turn to dive again. They were big boys, men, to Jerry. He dived, and they watched him; and when he swam around to take his place, they made way for him. He felt he was accepted and he dived again, carefully, proud of himself. Soon the biggest of the boys poised himself, shot down into the water, and did not come up. The others stood about, watching. Jerry, after waiting for the sleek brown head to appear, let out a yell of warning; they looked at him idly and turned their eyes back toward the water. After a long time, the boy came up on the other side of a big dark rock, letting the air out of his lungs in a sputtering gasp and a shout of triumph. Immediately the rest of them dived in. One moment, the morning seeming full of chattering boys; the next, the air and surface of the water were empty. But through the heavy blue, dark shapes could be seen moving and groping. 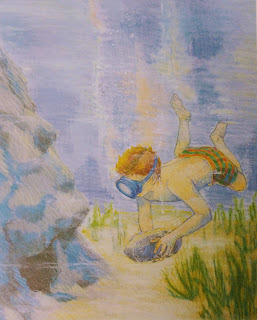 Jerry dived, shot past the school of underwater swimmers, saw a black wall of rock looming at him, touched it, and bobbed up at once to the surface, where the wall was a low barrier he could see across. There was no one visible; under him, in the water, the dim shapes of the swimmers had disappeared. Then one, and then another of the boys came up on the far side of the barrier of rock, and he understood that they had swum through some gap or hole in it. He plunged down again. He could see nothing through the stinging salt water but the blank rock. When he came up the boys were all on the diving rock, preparing to attempt the feat again. And now, in a panic of failure, he yelled up, in English, “Look at me! Look!” and he began splashing and kicking in the water like a foolish dog. At fifty, he was terrified. They must all be drowning beneath him, in the watery caves of the rock! At a hundred, he stared around him at the empty hillside, wondering if he should yell for help. He counted faster, faster, to hurry them up, to bring them to the surface quickly, to drown them quickly, anything rather than the terror of counting on and on into the blue emptiness of the morning. And then, at a hundred and sixty, the water beyond the rock was full of boys blowing like brown whales. They swam back to the shore without a look at him. He climbed back to the diving rock and sat down, feeling the hot roughness of it under his thighs. The boys were gathering up their bits of clothing and running off along the shore to another promontory. They were leaving to get away from him. He cried openly, fists in his eyes. There was no one to see him, and he cried himself out. It seemed to him that a long time has passed, and he swam out to where he could see his mother. Yes, she was still there, a yellow spot under an orange umbrella. He swam back to the big rock, climbed up, and dived into the blue pool among the fanged and angry boulders. Down he went, until he touched the wall of the rock again. But the salt was so painful in his eyes that he could not see. He came to the surface, swam to shore and went back to the villa to wait for his mother. Soon she walked slowly up the path, swinging her striped bag, the flushed, naked arm dangling beside her. “I want some swimming goggles,” he panted, defiant and beseeching. She gave him a patient, inquisitive look as she said casually, “Well, of course, darling.” But now, now, now! He must have them this minute, and no other time. He nagged and pestered until she went with him to a shop. As soon as she had bought the goggles, he grabbed them from her hand as if she were going to claim them for herself, and was off, running down the steep path to the bay. Jerry swam out to the big barrier rock, adjusted the goggles, and dived. The impact of the water broke the runner-enclosed vacuum, and the goggles came loose. He understood that he must swim down to the base of the rock from the surface of the water. He fixed the goggles tight and firm, filled his lungs, and floated, face down, on the water. Now, he could see. It was as if he had eyes of a different kind, fish eyes that showed everything clear and delicate and wavering in the bright water. Under him, six or seven feet down, was a floor of perfectly clean, shining white sand, rippled firm and hard by the tides. Two grayish shapes steered there, like long, rounded pieces of wood or slate. They were fish. He saw them nose toward each other, poise motionless, make a dart forward, swerve off, and come around again. It was like a water dance. A few inches above them the water sparkled as if sequins were dropping through it. Fish again, myriads of minute fish, the length of his fingernail, were drifting through the water, and in a moment he could feel the innumerable tiny touches of them against his limbs. It was like swimming in flaked silver. The great rock the big boys had swum through rose sheer out of the white sand, black, tufted lightly with greenish weed. He could see no gap in it. He swam down to its base. Again and again he rose, took a big chestful of air, and went down. Again and again he groped over the surface of the rock, feeling it, almost hugging it in the desperate need to find the entrance. And then, once, while he was clinging to the black wall, his knees came up and shot his feet out forward and they met no obstacle. He had found the hole. He gained the surface, clambered about the stones that littered the barrier rock until he found a big one, and, with this in his arms, let himself down over the side of the rock. He dropped, with the weight, straight to the sandy floor. Clinging tight to the anchor of stone, he lay on his side and looked in under the dark shelf at the place where his feet had gone. He could see the hole. It was an irregular, dark gap; but he could not see deep into it. He let go of his anchor, clung with his hands to the edges of the holes, and tried to push himself in. He had got his head in, found his shoulders jammed, moved them in sidewise, and was inside as far as his waist. He could see nothing ahead. Something soft and clammy touched his mouth; he saw a dark frond moving against the grayish rock, and panic filled him. He thought of octopuses, of clinging weed. He pushed himself out backward and caught a glimpse, as he retreated, of harmless tentacle of seaweed drifting in the mouth of the tunnel. But it was enough. He reached the sunlight, swam to the shore, and lay on the diving rock. He looked down into the blue well of water. He knew he must find his way through that cave, or hole, or tunnel, and out the other side. That day and the next, Jerry exercised his lungs as if everything, the whole of his life, all that he could become, depended upon it. Again his nose bled at night, and his mother insisted on his coming with her the next day. It was a torment to him to waste a day of his careful training, but he stayed with her on that other beach, which now seemed a place for small children, a place where his mother might lie safe in the sun. It was not his beach. He did not ask for permission, on the following day, to go to his beach. He went, before his mother could consider the complicated rights and wrongs of the matter. A day’s rest, he discovered, had improved his count by ten. The big boys had made the passage while he counted a hundred and sixty. He had been counting fast, in his fright. Probably now, if he tried, he could get through the long tunnel, but he was not going to try yet. A curious, most unchildlike persistence, a controlled impatience, made him wait. In the meantime, he lay underwater on the white sand, littered now by stones he had brought down from the upper air, and studied the entrance to the tunnel. He knew every jut and corner of it, as far as it was possible to see. It was as if he already felt its sharpness about his shoulders. He sat by the clock in the villa, when his mother was not near, and checked his time. He was incredulous and then proud to find he could hold his breath without strain for two minutes. The words “two minutes,” authorized by the clock, brought close the adventure that was so necessary to him. In another four days, his mother said casually one morning, they must go home. On the day before they left, he would do it. He would do it if it killed him, he said defiantly to himself. But two days before they were to leave — a day of triumph when he increased his count by fifteen — his nose bled so badly that he turned dizzy and had lie limply over the big rock like a bit of seaweed, watching the thick red blood flow on to the rock and trickle slowly down to the sea. He was frightened. Supposing he turned dizzy in the tunnel? Supposing he died there, trapped? Supposing — his head went around, in the hot sun, and he almost gave up. He 5 thought he would turn to the house and lie down, and next summer, perhaps, when he had another year’s growth in him — then he would go through the hole. But even after he had made the decision, or thought he had, he found himself sitting up on the rock and looking down into the water; and he knew that now, this moment, when his nose had only just stopped bleeding, when his head was still sore and throbbing — this was the moment when he would try. If he did not do it now, he never would. He was trembling with fear that he would not go; and he was trembling with horror at that long, long tunnel under the rock, under the sea. Even in the open sunlight, the barrier rock seemed very wide and very heavy; tons of rock pressed down on where he would go. If he died there, he would lie until one day — perhaps not before next year — those big boys would swim into it and find it blocked. He put on his goggles, fitted them tight, tested the vacuum. His hands were shaking. Then he chose the biggest stone he could carry and slipped over the edge of the rock until half of him was in the cool, enclosing water and half in the hot sun. He looked up once at the empty sky, filled his lungs once, twice, and then sank fast to the bottom with the stone. He let it go and began to count. He took the edges of the hole in his hands and drew himself into it, wriggling his shoulders in sidewise as he remembered he must, kicking himself along with his feet. Soon he was clear inside. He was in a small rockbound hole filled with yellowish-gray water. The water was pushing him up against the roof. The roof was sharp and pained his back. He pulled himself along with his hands---fast, fast---and used his legs as levers. His head knocked against something; a sharp pain dizzied him. Fifty, fifty-one, fifty-two... He was without light, and the water seemed to press upon him with the weight of the rock. Seventyone, seventy-two... There was no strain on his lungs. He felt like an inflated balloon, his lungs were so light and easy, but his head was pulsing. He was being continually pressed against the sharp roof, which felt slimy as well as sharp. Again he thought of octopuses, and wondered if the tunnel might be filled with weed that could tangle him. He gave himself a panicky, convulsive kick forward, ducked his head, and swam. His feet and hands moved freely, as if on open water. The hole must have widened out. He thought he must be swimming fast, and he was frightened of banging his head if the tunnel narrowed. A hundred, a hundred and one…The water paled. Victory filled him. His lungs were beginning to hurt. A few more strokes and he would be out. He was counting wildly; he said a hundred and fifteen, and then a long time later, a hundred and fifteen again. The water was jewelgreen all around him. Then he saw, above his head, a crack running up through the rock. Sunlight was falling through it, showing the clean, dark rock of the tunnel, a single mussel shell, and darkness ahead. He was at the end of what he could do. He looked up at the crack as if it were filled with air and not water, as if he could put his mouth to it to draw in air. A hundred and fifteen, he heard himself say inside his head — but he had said that long ago. He must go on into the blackness ahead, or he would drown. His head was swelling, his lungs cracking. A hundred and fifteen, a hundred and fifteen pounded through his head, and he feebly clutched at rocks in the dark, pulling himself forward, leaving the brief space of sunlit water behind. He felt he was dying. He was no longer conscious. He struggled on in the darkness between lapses into unconsciousness. An immense, swelling pain filled his head, and then darkness cracked with an explosion of green light. His hands, groping forward, met nothing; and his feet, kicking back, propelled him out into the open sea. He drifted to the surface, his face turned up to the air. He was gasping like a fish. He felt he would sink now and drown; he could not swim the few feet back to the rock. Then he was clutching it and pulling himself up on to it. He lay face down, gasping. He could see nothing but a red-veined, clotted dark. His eyes must have burst, he thought; they were full of blood. He tore off his goggles and a gout of blood went into the sea. His nose was bleeding, and the blood had filled the goggles. He scooped up handfuls of water from the cool, salty sea, to splash on his face, and did not know whether it was blood or salt water he tasted. After a time, his heart quieted, his eyes cleared, and he sat up. He could see the local boys diving and playing half a mile away. He did not want them. He wanted nothing but to get back home and lie down. In a short while, Jerry swam to the shore and climbed slowly up the path to the villa. He flung himself on his bed and slept, waking at the sound of feet on the path outside. His mother was coming back. He rushed to the bathroom, thinking she must not see his face with bloodstains, or tearstains, on it. He came out of the bathroom and met her as she walked into the villa, smiling, her eyes lighting up. “Have a nice morning?” she asked, laying her hand on his warm brown shoulder. “Oh, yes, thank you,” he said. “You look a bit pale.” And then, sharp and anxious, “How did you bang your head?” “Oh, just banged it,” he told her. She looked at him closely. He was strained; his eyes were glazed-looking. She was worried. And then she said to herself, Oh, don’t fuss! Nothing can happen. He can swim like a fish. They sat down to lunch together. “Mummy,” he said, “I can stay under water for two minutes — three minutes, at least.” It came bursting out of him. She was ready for a battle of wills, but he gave in at once. It was no longer of the least importance to go to the bay. Does the setting of the story help portray the conflict? Why or why not? What colors does the author use to describe the mother and the beach? What colors are used to describe the boys swimming in the bay and the bay itself? What do you think this contrast in colors implies? How would you describe Jerry’s and his mother’s relationship at the opening of the story (note paragraph 5-6)? How does this relationship change when the conflict is resolved?